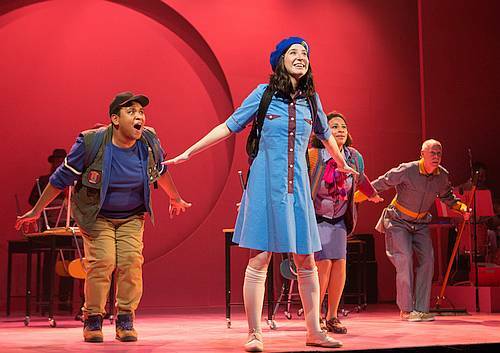 There are a lot of great things about Rose: A New Musical on stage at Soulpepper right now. It’s an evening filled with fantastic performances of great music, delightful costumes, and evocative design. It sounds sure to please. Unfortunately, despite all the great individual elements, they didn’t come together as a whole for my show partner or me. I’ve got this question going ’round and around in my mind. It’s a big question. It is who am I? And I can’t say my name until I know that. To say it would be like a lie. A name means a lot, I think. You can’t just say it because you are asked to. It’s full of the you-ness of you. You have to know your answer is true. And the piece follows her as she sets out to find the answer to who she is. She gets help from her best human friend – Willy (Peter Fernandes), her best dog friend – Love (Jonathan Ellul), and several people from the town of Somewhere. The piece is brimming with potential, but at its core, it felt like it was trying to do too much. Ironically, it felt like it was suffering a bit of an identity crisis of its own. I couldn’t help feeling like it couldn’t decide what it wanted to be. With so much on offer, it was hard for me to latch on and really dig into it. My show partner said that for her, she would frequently lose the point of what was happening on stage. She said that, while there were moments she really enjoyed, the show as a whole just didn’t capture her. One of the things that doesn’t work for me is the show tries to be a goofy light show and a serious thoughtful piece in equal measure. I always want to see serious moments in goofy fluffy pieces, it helps ground them. And I always want to see funny moments in serious thoughtful pieces. It breaks the tension, and frankly, makes them feel more real. In the artist notes from Sarah Wilson, co-creator with Mike Ross, she says “Rose is a story of opposites. . . . The show is both serious and very silly.” And I think that’s great. But something happens when you try to make the two exist in balance. There isn’t enough tension. Symmetry is too comforting. With both in equal amounts, I couldn’t entirely focus on either – they ended up distracting from, not enhancing, each other. But that wasn’t the only part that felt indecisive. It also felt unclear whether this was aimed at kids or adults. The piece has a distinct kid-feel to it, although certainly can be enjoyed by adults. It does an excellent job of bridging that gap of fun for both kids and adults. It’s full of nudge-nudge-wink-wink jokes for adults, sailing over kids heads and leaving adults smirking, while being loaded with relatable fun for kids too. This is no stage version of Paw Patrol – despite the talking dog. But when I mentioned that Rose is recommended for audiences “ages 5-105” to my show partner, she expressed doubt and asked if I was sure. I get where she was coming from. I have a 7- and 9- (almost 10, just like Rose) year-old. There are things they would have loved in the show. But there are also moments that would have been too scary for them. To be fair, it’s important to note here that my kids are sensitive to scary things, but there are some intense moments in the second act. It’s not just about the scary bits though. The two and a half hour runtime (which included a 20-minute intermission) felt like a bit much for both of us. We couldn’t imagine how that would feel for the average kid. I admit that for me, part of this goes back to not being fully engaged in the show. I have certainly been to shows that long or longer before and barely noticed the length. But it seems long for a kid. The thing is, I think the length is also a symptom of the piece trying to do too much. I absolutely understand why it would be hard to cut it down because as I said, as individual parts, everything was delightful. There is nothing that, when looked at on its own, I could imagine going “oh, no, this isn’t very good, let’s just cut it.” It’s more about looking at things as a cohesive whole. Looking at what moves the story forward and what doesn’t. It felt to me like this was a fantastic production of a script that still needs work. The whole ensemble is terrific, it is a stage full of incredible talent. When I asked my show partner what her favourite part was, she answered without hesitation, “Rose.” I asked for a bit more clarification, and she said: “It was hard not to watch her as an actor.” It is absolutely true. Hailey Gillis inhabited the character of Rose beautifully. As Willie, Peter Fernandes also captured my heart. He really brought a lot of the physicality of a nine-year-old boy to the stage. There is a moment when he slides out of a chair that is so perfect I forgot that he was an adult playing a kid. Alana Bridgewater plays a number of characters, although, for me, most notably the Mysterious Lady, and I have to say I would watch her do anything. She is absolutely incredible and owns the stage whenever she is on it. Lorenzo Savoini’s design was beautiful. The show had some of the best use of projections I have seen in a very long time. I loved them. And the lighting felt perfect. Alexandra Lord’s costumes were spectacular, playful and evocative. I really enjoyed Gregory Prest’s direction. It is no surprise to me that Mike Ross’s music was wonderful, I have yet to hear music by Mike Ross that I haven’t loved. I suppose in the same way that this play is “a story of opposites” this review is a story of opposites too. Even though the show didn’t gel for me, the production itself was bang on. And, while I may not have loved it, a lot of the audience seemed to really enjoy it. This may be one of those shows that you need to experience for yourself to know whether or not it’s for you.